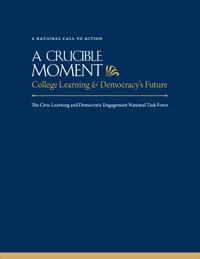 Recognizing the urgent need for colleges and universities to address their civic mission and that of higher education, Civic Provocations features accessible, brief essays that consider dimensions of what "centering attention to the civic" might mean and involve. 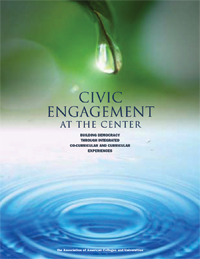 Civic Provocations provokes deepened consideration and campus conversations-both needed for designing actions required to realize a civic mission. 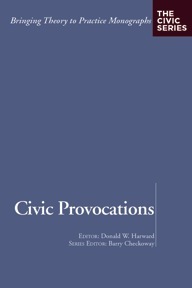 The provocations are written by leading civic scholars and practitioners; the topics range from civic learning to action research; from global civics to civility; from curricula to civic pedagogy; and from theory to practices. This entire monograph is available as a PDF document (see link below), and additional print copies can be purchased by clicking below.